My first introduction to the wonders of theatre was in a stuffy classroom in fifth year, where we drudged our way through the awkward lines of Shakespeare’s Scottish play. Boredom drove me to the notes on the back of the curious smelling vintage copy I’d picked up in a secondhand store. The notes highlighted the fact that Macbeth is not seen on stage murdering Duncan and so, the audience remains sympathetic to his guilt. Mind blown. I’d never before understood that a playwright could really have that much influence on the audience just by such a small trick like that. And so I was hooked on theatre and all its intricacies. 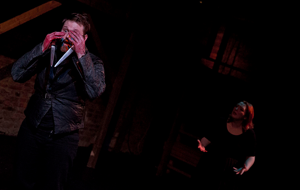 Fast Intent’s currently production of Shakespeare tale of vaulting ambition uses the spooky interior of Smock Alley Theatre to superb effect with a cast of dark characters, subtle music and passionate performances. The exposed brick wall, dusky lighting and high, tunnel-like ceiling transports the audience to a bygone era. If you’re not a Shakespeare fan then the dialogue can be tough going in parts but Macbeth is such a great tale of deceit and ambition that it remains a timeless classic. Plays at Smock Alley until January 25. As far as cities go, Dublin manages to patch colourful characters against a very grey backdrop. The people of the city ebb and flow against one another in a constant struggle of perseverance against the unforgiving landscape of recession-ridden Dublin. Lives are intertwined. We push and pull one another in an attempt to keep our heads afloat although some give up and let their heads sink beneath the surface to escape the circus. Gonzo Theatre returns to Dublin, bringing its ragtag tale of the lives of Dublin’s fair city to the Smock Alley stage, with all the madness, playfulness and brashness of good experimental theatre. The ringleader choreographs a line up of talented and versatile actors into playing out the harsh yet sometimes uplifting characters of ordinary folk in a struggle to keep on top … of top of what? Life I suppose. Lots impressed me about The Circus of Perseverance – the stories are simple, but carefully intwined to retain lots of momentum throughout this two-hour show. The performances are hugely demanding on the actors, but delivered well (especially from Rex Ryan and Patrick O’Donnell). And the music? Well, the music is just superb. Alan Darcy and Peter Denton strum and beat their way through the show with exhilarating electric guitar pieces and some atmospheric tin whistle playing to create a sensory experience that keeps drawing you in. The stories told in The Circus have probably been told before in many other formats, but it doesn’t matter. How they’re told in this show is unlike any others and is guaranteed to draw you in with a few chuckles, some really captivating performances and the perfect musical accompaniments. Not to be missed. Plays until November 30 at Smock Alley Theatre. Find out more here. Ireland is a nation of strong women. When you go way back to the Celtic era you can see where we get it from. Throughout the years, strong women like Grainne Mhaol and Constance Markievicz have influenced the psyche of the Irish female to imbue in us a strong sense of self, justice and pride. And no better place to explore feminine strength than in the tenements of 1950s Dublin. Queens of Pimlico tells the story of two sisters, whose love for one another can triumph even against betrayal and misfortune. This is the third production I’ve seen by Derek Masterson’s No Tears production company and they always manage to find a gentle balance between humour and genuine drama. While the misfortune of the characters doesn’t create an uplifting story, the characters’, and in particular Rita’s character lighten the mood through real warmth and humour even in the darkest times. Recommended as a good insight into the plight of women during the 1950s and also if you fancy a good story, well told and with some tear-jerking moments thrown in for good measure. Plays at the Civic Theatre until November 30. More info on securing tickets here.